Where: AI lists Corstopitum as 9 Roman miles from Vindomora (Ebchester) and 20 from Bremenium (High Rochester), which cannot be correct, because the total distance Vindomora–Bremenium as the crow flies is 33 miles, not 29, and trying to follow the wiggles of the Roman road just makes the discrepancy worse. However, amending viiii (9) to xiiii (14) miles would place Corstopitum somewhere near Little Whittington (NY991695), where the straight lines of the Roman roads later known as Dere Street and Devil’s Causeway would originally have intersected, or Beukley (NY983707) where their curved (possibly later) versions met. Name origin: R&S described Corstopitum as “meaningless in British” and then launched into some unnecessary emendation. However the name as written makes sense in Greek as a compound of κορση ‘(fore)head’ (from PIE *ker- ‘horn, head’) and τοπιτης ‘of a place’ (from τοπος ‘place’ plus the suffix -ιτης that still survives in English as –itis. This might reasonably describe that road junction on a local high place. Greek explanations for place names in Britain might arise in several ways, such as passing into Latin as technical terms or just being a surrogate for some other unknown language. There is clear evidence for actual Greek in the nearby name Επιακον, a site of lead and silver mining, which was a technology mainly developed in Greece. 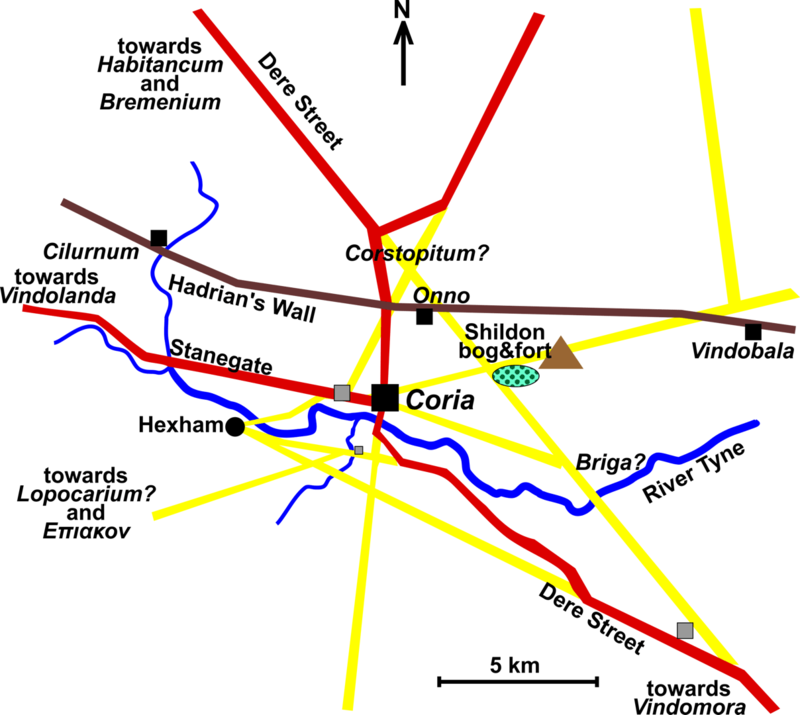 Notes: This analysis places Corstopitum 5 km north of Corbridge, hinting that the road junction existed first, before a full-scale Roman town and supply base developed beside the river Tyne, with Hadrian's wall running between the two. Here is a crude map of the neighbourhood of Corbridge, showing the generally accepted Roman roads (in dark red), plus other roads that Selkirk (1995:98-105) suggested as Roman (in yellow), which offer plausible locations for Corstopitum, Briga, etc. Warning: some archaeologists are deeply hostile to Selkirk, but he often showed a better grasp of geography than his critics.